Although the very name 'oriental poppy' can conjurer up images of remote and verdant Chinese hillsides, Papaver orientale doesn't come from anywhere near as far away as that. In fact the word 'oriental' stems from an earlier era when Europeans viewed the exotic regions east of the Mediterranean as lands full of romance and intrigue. Geographically, lands of the oriental poppy spread from the Caucasus, north-eastern Turkey, and northern Iran. And it's these harsh, dry environments which have made the oriental poppy what it is. With only a short growing season, these plants need to grow, flower and become pollinated as fast as possible. The trouble is that the other native plants that the oriental poppy shares its home with tend to flower at the same time, and this creates a highly competitive environment for limited resources. Therefore, big, bright flowers are an absolute necessity in order to attract the maximum about of insect pollinators in the shortest possible time. But it doesn't stop there. After flowering the foliage dies away entirely, a strategy that allows their continuing survival in the summer droughts of Central Asia. So there is no getting away from the fact that as far as ornamental plants go, the oriental poppy doesn't flower for very long - two to threes weeks at best. But when it does, it is truly spectacular and certainly well worth the wait. The scarlet, flamboyant, paper-like, scarlet blooms, appear in late May or early June. They usually have a black blotch at the base of each petal, and and each flower can be up to an 'eye boggling' 5 inches wide! Numerous cultivated varieties have been produced over the years, many of which have been awarded the Royal Horticultural Society's 'Award of Garden Merit'. Perhaps the most popular cultivar is Papaver orientale 'Patties Plum'. This cultivar flowers earlier than most, but tends to fade in sun. Incredibly, it was discovered on the compost of heap of a nearby Somerset nursery woman - Mrs Patty Marrow. 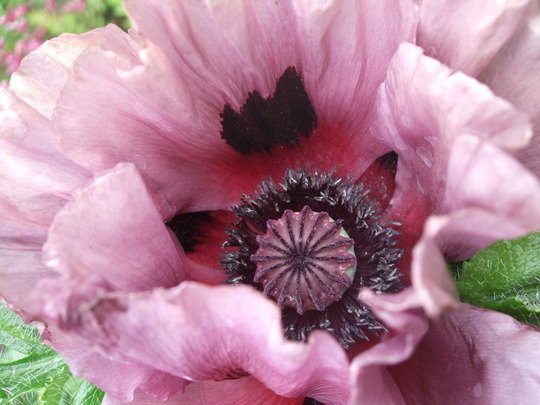 The oriental poppy is easy to grow, but prefers an free draining soil in full sun. If they are in an exposed site then they may need staking in order to support the tall flower stems. If you are lucky, then you can encourage a few more flowers in the autumn if the the first flower stems are cut down after flowering. Oriental poppies are easily propagated by division in March or April.